It’s incredibly easy to become lost in the abundance of ornate decorations, bright lights and brilliant sparkles, and the lure of holiday sales. The holidays are about more than the glitz of the season and its material offerings. The narrative surrounding the true meaning of the holiday being retold every November may seem obvious, but the concept may be difficult for your little ones to understand. Easily distracted by the excitement of parties and gift giving, you may find your children have a tendency to misdirect their focus during the holidays. Here are just a few ways you can keep your children’s minds on the right things this holiday season. Children can be impressionable, hence why the bounty of advertisements during this season have a great impact on them and their expectations for the holidays. This vulnerability, however, can work in your favor when trying to teach them about the season’s real focus. Challenge your child to ask those around them, such as family members or teachers, what their favorite thing about the holidays are. The more times they hear meaningful responses relating to an appreciation for family bonding or showing gratitude for traditions, the more conditioned they will become to associate the holidays with blessings beyond gifts. After they’ve learned a bit more about what others love about the holiday season, ask your child to list three things they enjoy about the holidays that don’t relate to material objects. Post these three things on your family’s fridge as a loving reminder of what truly matters this season. 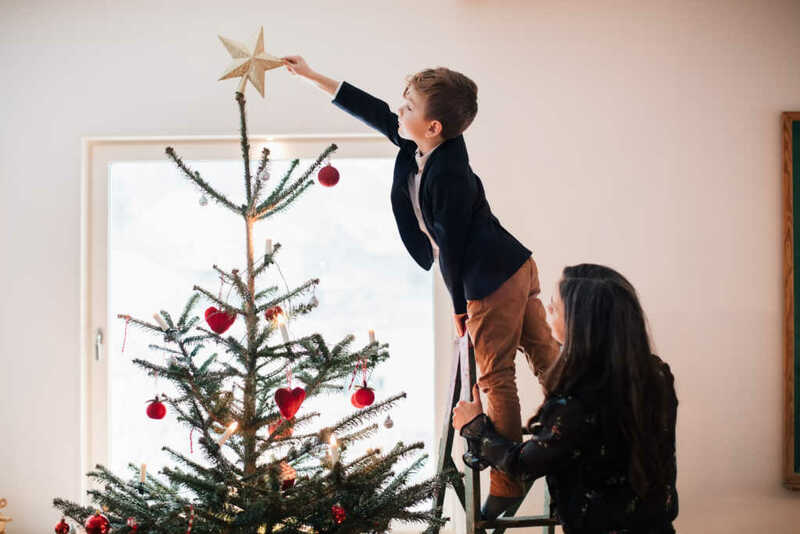 After planting the seed in your child’s mind that perhaps the holidays may just be about more than gifts and festivities, introduce the narratives surrounding Christmas. When discussing Christmas, introduce your child to the Nativity story in order to help them understand why December 25th is celebrated every year. Teaching your child about the origin of this holiday is vital in fostering their recognition that it exists for reasons beyond receiving gifts. Explain that the intentions of the parties thrown on or around Christmas are in honor of Jesus’ birthday. There are tons of kid-friendly storybooks that can teach the story of the birth of God’s son, the gifts of the Magi, and the significance this birth holds in their current life. Reading these stories with great enthusiasm will bring the story to life and truly engage your child in the spirit of Jesus’s celebration. If you’re looking for other tools beyond books, there are wonderful Christian movies that focus on the Nativity story and other significant narratives in the Bible! Encourage your child to walk in Jesus’s footsteps as they celebrate during the holiday season, intentionally behaving with grace in order to experience its true meaning. Focus on the general characteristics that Jesus possessed, like selflessness and humility. Have a discussion with your child about what it means to have these same characteristics and how they could potentially play out within their daily routine. To place an emphasis on selflessness as one pillar holding up the holidays, encourage your child to give back to their loved ones and community. Challenge them to volunteer their time at least once every weekend leading up to Christmas in some way that benefits your local community. Teach them to do so with the intention of giving back as a form of appreciation for their town and its residents. During your next family holiday gathering, challenge them to focus on having at least one conversation with each family member, placing emphasis on the importance of connecting with loved ones. Prior to them inevitably receiving a gift, practice the appropriate response to ensure they are demonstrating gratitude. Remind them that their excitement shouldn’t stem from having gained a gift but rather from the fact that someone they care about thought of them and wanted to show their appreciation and love through this gesture. Conversations like this can work to curb your little one’s perception of the holidays while they are enjoying them! Florida-based Christian Care Ministry operates the Medi-Share health care sharing program through which members voluntarily and directly share each other’s medical bills. Since the program’s inception in 1993, Medi-Share members have shared more than $1.8 billion in medical bills. And because of access to an extensive network of more than 700,000 health care providers, members have saved an additional $1.1 billion in medical costs during that time. Medi-Share has over 400,000 members in all 50 states. More than just health care, Christian Care Ministry is a community of people who share their lives, faith, talents and resources and pray for and encourage one another. For more information, visit MyChristianCare.org/Medi-Share. Facebook: https://www.facebook.com/MyChristianCare. Twitter: @ccm_medishare. Instagram. medi_share.